The second Club Penguin Rewritten Anniversary Party has begun, themed around purple and white, with a new pin, hat and yearbook! 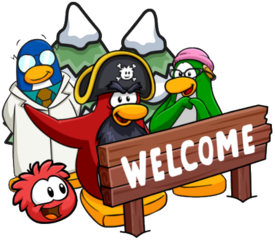 Several mascots are expected to visit for this party, but Aunt Arctic is the only confirmed one. You can view the Aunt Arctic tracker here. Most of the decorations for this party are over at the Coffee Shop, including the cake, wall paintings and several balloons! You can also obtain the Ice Cream Apron in a box near the bottom. If you click hover over the cake’s candles at the top to blow out them out, you will receive the Celebration stamp too! The 2nd Anniversary Hat can also be obtained here! 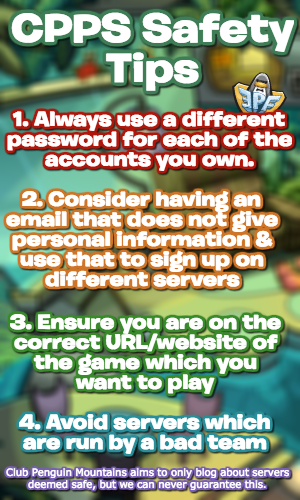 In order to do this though, you’ll need to click the pinata in the top right a couple of times, or wait a few seconds. It’ll then fall out, and you can click it to obtain it. Make sure to get it as it’ll never return after this party! If you waddle upstairs into the Book Room, you’ll be able to find a new pin located near the bottom left, near your map and next to the lamp and the chair. This is the 2nd Anniversary Cake Pin and also won’t be obtainable after this event is over. Lastly, and one of my favourite bits of this event, the new yearbook has been released! Inside, it features some of the highlights from the last year on the island, including different parties and events. In order to view it, simply click the bookshelf and the new purple book. It’s super beautiful and by far my most favourite one; it’s really filled with incredible decorations. Along with this, on the final page, it contains a secret message written in the PSA code. Be prepared agents, it is almost time! It really does look like the EPF rebuild is rapidly approaching, especially with a lot of foreshadowing over the last few weeks, including in the yearbook! I really do love the yearbook this year though. July 2018 page of the yearbook – beautiful! In terms of the blog, a new wallpaper was also released to celebrate the anniversary with some really cute penguins. Also, just to note as there has been some confusion, the iceberg will not tip for this event. Be sure to collect everything before the party ends; most of it will be exclusive! I hope that this guide helped, thank you for reading! Just an FYI: You don’t have to click the Pinata nor the candles to interact with them (break the Pinata, blow the candles). Just hover your mouse over them. its over now PREPARE for the UNDERWATER EXPEDITION PARTY ill be a very awesome and very amazing EVENT OR PARTY call it either way.